I started at age 15 and trained for three years under the late sensei Rob Campbell, then joined Wushu Kung Fu while at university. Some 20 years later my oldest son expressed a desire to learn, and 3 years later all three of my boys are training with me, ages 6, 8 and 11 under sensei Hayden Wilmott. Its been fantastic to be able to participate with them and not just watch from the sideline. In 2013 we all travelled to Okinawa to train which was an amazing experience. Then in 2014 I achieved my Sho Dan. 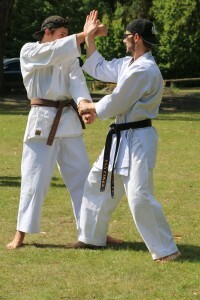 Karate offers a mental and physical challenge to anyone, and our club enjoys a very supportive team environment. Karate is especially beneficial to children, not only for the obvious self defense and fitness benefits, but also for the fair discipline and good behavioural expectation. 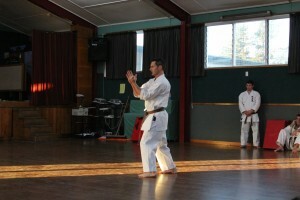 Sensei Hayden blends this very well with fun and humour, which explains his huge following of children and immense respect. I feel very proud of all the children as we witness their growth and achievements, and I hope to ensure they gain the self confidence, fitness and enjoyment that Karate has given me and my boys.